Although, the subject of "Bump-Keying", also known as the "999 Method" is often presented as a cutting-edge cylinder manipulation technique and has recently surfaced as "breaking news", the practice has been familiar to Mul-T-Lock and the locksmith industry for many, many years now. Some present the method as an undetectable and simple way to bypass high security; this, however, is not the case, and Mul-T-Lock’s high security cylinders are amply prepared to resist this type of attack. Hobbyists who claim to have the ability to defeat our locks have been found to be using pretreated or precooked (altered in advance) cylinders that are designed to trick the naked eye, much like an amateur magician’s "special" deck of cards. Such "magicians" have recently attempted to bombard the internet with claims that Mul-T-Lock and other well-known high security locks can be easily picked or bumped. Some have even released online videos that supposedly demonstrate this ability. These claims are simply false! What they’re not showing you is the preparation of these cylinders. These enthusiasts are certainly not using high security cylinders that have been properly assembled and installed but rather manipulated versions that have been carefully taken apart with many of their high security elements removed - essentially converting them into standard security cylinders under the guise of a high security name. Some have even used slight of hand tricks that casually disguise the fact that their supposed "bump" keys are actually the cylinders legitimate operating key! 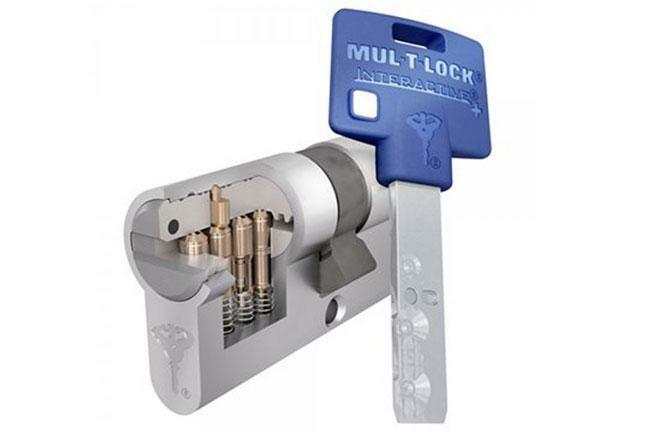 Mul-T-Lock’s Interactive® high security products are designed to defend against a vast array of manipulation techniques on real world applications, and we confidently assert that unauthorized entry will not be gained by anyone under such conditions. Not a single one of these supposedly successful bumping attempts was performed with a non-treated Interactive® Mul-T-Lock cylinder. Mul-T-Lock’s bump-resistant Interactive® cylinders, as they are assembled in our factories and distributed throughout our network of authorized professional dealers are not susceptible to this type of attack. So if you’re concerned about what you’ve heard or seen online, check the sources. Mul-T-Lock has rightfully earned our reputation as the world’s number one high security lock manufacturer for a reason. We are always on the lookout for new threats, and staying a step ahead of the game is what we do best. You can be sure that being protected by Mul-T-Lock means being protected by a company that incorporates global experience and worldwide know-how into each and every product. With a UL 437 listing for pick and drill resistance and having surpassed many international standards like CEN, VDS, and SKJ, to name a few, Mul-T-Lock offers the ultimate high security protection against picking, drilling, bumping, and unauthorized key duplication. For over four decades, Mul-T-Lock® has been a worldwide leader in developing, manufacturing and marketing High Security locking products and access control solutions for institutional, commercial, industrial and residential applications.